I confess right off the bat that I have a crush on the silky crush ribbon.... yes, it's corny, but oh so true! You'll probably find me saying that I am in puppy love with pretty much every ribbon Bonnie has in the store, but there is just something so irresistible about this line of ribbons.... so yes, I think I ordered them all. ha! When I received my ribbon kit for this month (okay, have to stop and go SQUEAL for a moment.... isn't it fabulous?!?!!? ), I noticed how well the golds blend with the champagne silky crush. Bingo! - card making time! I needed a card for some friends of ours who married, so the golds went perfectly with the blues from their color scheme. the delicate stitched satin old gold from the kit, paired with the champagne silky crush, a pop of white from the ever so lush double faced satin ribbon, and this card is ready to go! Beautiful image. 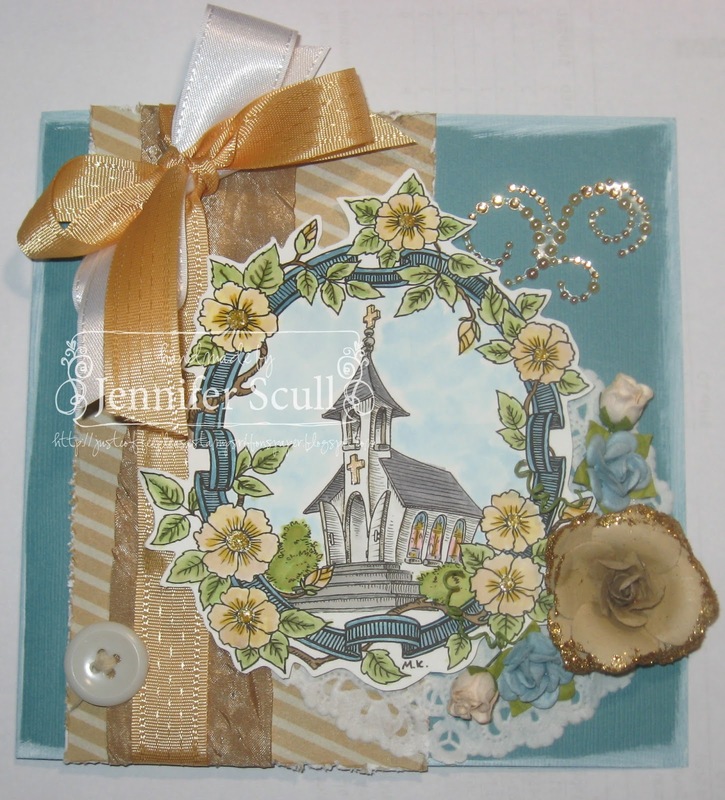 Love the the flower and gorgeous choice of ribbon for this card. Yes, I am on cloud nine enjoying every minute being on the Really Reasonable Ribbon design team. Love your wedding card. This is so pretty! Love your image and all your embellishments!